NU and HACU introduce STEM career paths to middle and high school students. I am so proud to work in higher education at a university that makes a positive impact in so many lives. Recently, National University was selected by the Hispanic Association of Colleges and Universities (HACU) to host 700 middle and high school students of diverse backgrounds to meet with leaders in the science, technology, engineering and math (STEM) community for a day of fun, engaging activities designed to inspire and encourage them to pursue STEM fields. 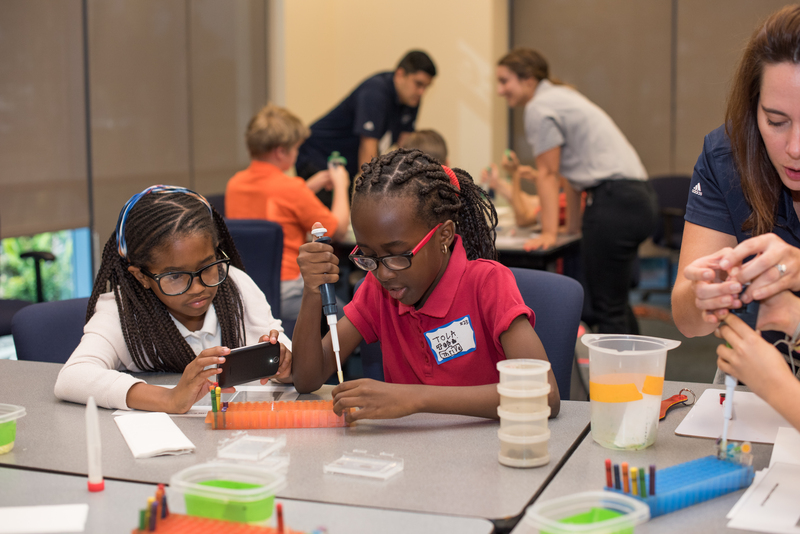 At National University, we believe in the power of education to transform lives for the better, and through community events like the youth STEM day, we have the opportunity to inspire young students to become lifelong learners. I’d like to thank the faculty and staff who devoted their time to work together with other leaders in the STEM community to share their excitement, experiences and knowledge in the STEM fields with all of the bright, young students. As I talk about the importance of service, this is a special month when we not only celebrate the U.S. Marine Corps 242nd birthday, but we pause to recognize the service and sacrifice made by all who have bravely served our country. As a veteran-founded, nonprofit university, it was an honor to host the Veterans Day Recognition Ceremony to acknowledge our student veterans and all who have served. We were also thrilled to welcome home U.S. Marine Corps veteran Maggie Seymour, who recently completed a 100-day, coast-to-coast run across the United States to raise awareness and support for military and education-related causes and communities. Maggie, along with California State Assemblyman Rocky Chavez, who is a retired Marine Corps Colonel, addressed the National University Student Veterans Organization (NUSVO), which is led by NU student veteran and NU Scholar, Jerimiah Chambers. At NU, we are so proud of the hard work that our military students contributed during their years of service to our country, and we are honored to serve our military students and support their continued success. I want to congratulate the 2017 National University Veterans Victory and National University Student Veteran Organization scholarship recipients and applaud the contributions of our 2017 ACCELERATE faculty participants. I’d also like to thank those in our NU community who joined The Mission Continues Veteran Service Project to enhance the campus at Herbert Hoover High School in San Diego. 2017 NU/City of SD Scholarship recipients. We are dedicated to developing education partnerships with the communities we serve, including the public sector and other entities that serve the public good. 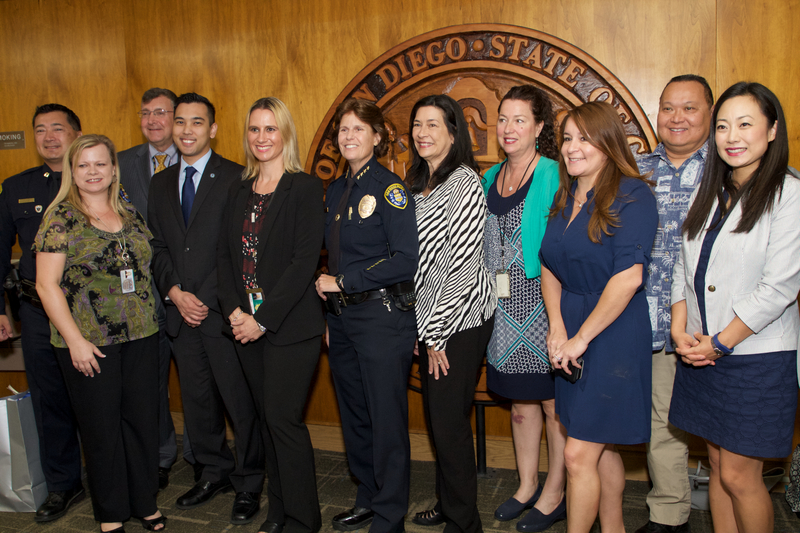 We are so fortunate to be the Preferred Education Partner of the City of San Diego, and I’d like to congratulate the recent recipients of the National University/City of San Diego Professional Development Scholarship. Danielle Schule, who is a San Diego Police Department Dispatch Supervisor and a dedicated public servant, received a full scholarship to complete her studies at NU. She recently trained more than 100 officers who volunteered to work with dispatchers to help reduce 9-1-1 call times. I’d also like to congratulate our two additional finalists Phillip Haughey, a firefighter who has served with the San Diego Fire-Rescue Department for the past 11 years; and Jonathan Ferreras, Operations Support Manager who has worked for the San Diego City Attorney’s Office the past nine years. Both will receive partial scholarships to pursue their education goals. I am pleased that National University is continuing the commitment of our founder, Navy Captain David Chigos (Ret. ), to serving our community and advancing lifelong learning opportunities that support the continued success of our students. As this is the season of gratitude, I’d like to thank all who have served and all who are serving in our armed forces. I’d also like to express my appreciation for friends and colleagues at National University. Thanks for all that you do for NU and for your community. I hope you all have a Happy Thanksgiving!